I really wish there was an easy way to make an online course. Today, we’ll walk you through the exact process we use to create mini-courses for DottoTech. 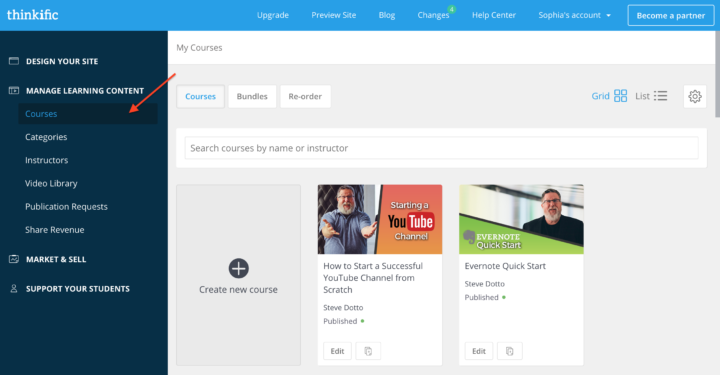 Thinkific is a learning management software. But what does that mean in practice? At its heart, Thinkific is a course-hosting platform. It’s a space where entrepreneurs, educators, consultants, and anyone who wants to teach, can host, market, and sell their online course. It’s the home to 99% of the Dotto Tech course catalog— with only one notable exception missing. The simple, clean interface, powerful integration with your CRM, and fantastic support make this platform a delight to use. The team is always working behind the scenes, tweaking functions and crafting updates. It feels like every time I log in, there’s a shiny new improvement waiting to be tried out. Thinkific handles everything– from hosting your content and landing pages to delivering the material and collecting payments. But how easy is it to create course? Let’s take a look! Getting started with Thinkific is free. While the free account does have limitations, it’s a great way to test-drive the software and decide if it’s right for you. Let’s walk through a simple course creation process. The menu usually hangs out on the left-hand side. The right-hand side is reserved for your content. Thinkific will serve up a few delectable options. You can master-craft your course from scratch or use the mini or flagship templates to save yourself some time. Thinkific doesn’t stop at course templates– it also offers a few course-related options that may come in handy. Pre-sell. If you’re not quite ready to commit you can create a landing page and measure interest in your course by collecting the emails of interested folk. Host a file library. Don’t want to deliver an entire course but desperate to share some resources? You can create a file library full of useful downloadables. Make a membership library. Maybe you’re ready to run right past courses and create a full-on membership library full of exciting materials. With Thinkific, you can. Host webinar replays. 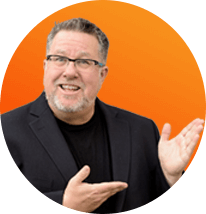 If you run webinars and want to share the replay in an easy-to-use platform, this can be the answer. But enough about all these other exciting options. Let’s get back to some good old course creation. This is the latest mini-course we made. It uses a re-purposed webinar as its base. To support it, we added some extra training materials and resources. 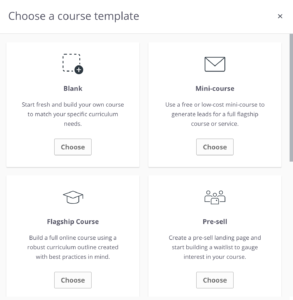 Your course creation menu will look pretty similar. The course is divided into chapters and each chapter holds various assets. You can have as many (or few) chapters as you want. What kind of assets can you add to your chapter? You’ve got plenty of choices! 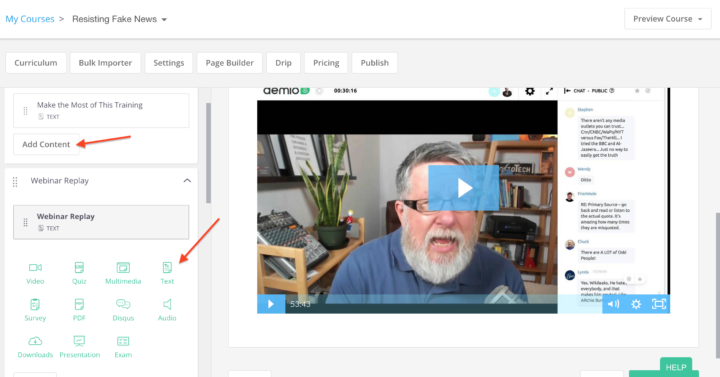 To add an asset click on the “Add content” button at the bottom of each chapter then select the type of content you’d like to add. 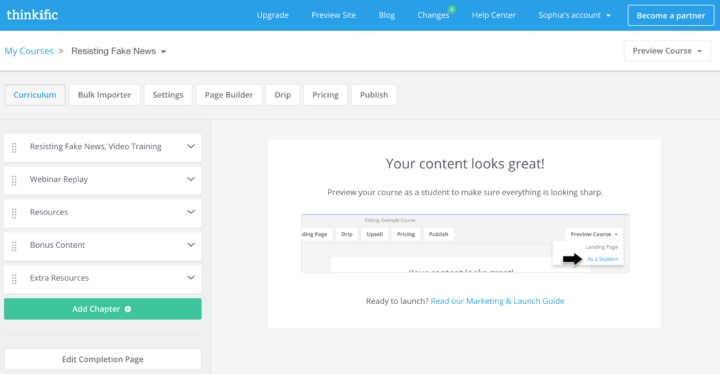 In the menu that runs along the top, you’ll see a few other options that relate to your brand new course. Bulk Importer. Use it to upload all your course materials in one smooth move. Page Builder. 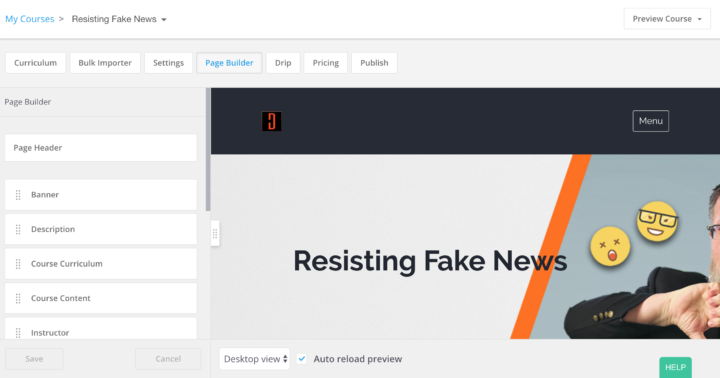 Design a winning landing page for your course and add elements like a custom banner, information about you, a course description, and upsells. Drip. You can set the course to be delivered a lesson at a time. Pricing. Choose a price and decide whether you’ll offer payment options. 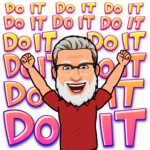 When you’re ready, just hit publish. Walking you through everything Thinkific can do would take days. This marvelous platform is equipped with the tools you need to create and market an online course. We use it to handle all our course creation needs and if you’re looking for an easy to use LMS, check it out.